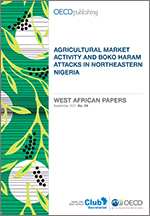 This paper examines the linkages between Boko Haram activities in northeastern Nigeria and declined activities in regional agricultural markets. Building on data from both the Armed Conflict Location and Event Data Project (ACLED) and the Famine Early Warning Systems Network (FEWS NET), the paper first considers the geographic distribution of Boko Haram events with respect to market towns and discusses whether there is evidence of Boko Haram activities near markets having influence on declined market operations. Next, it examines the temporal character of market operations and the timing of their changes in their operational status, including market closures, with respect to the seasonality of agricultural production and land use in northeastern Nigeria. The paper measures the frequency of changes in regional market activities and considers spatial relationships and temporal correlations with Boko Haram activities in the region over twelve periods from late 2014 through the end of 2016. Finally, the paper formulates policy recommendations for assessing and mitigating coupled challenges of human and environmental security.